Yesterday turned out to be a pretty good day. It was sunny but insanely windy - like 30+ mph winds all day. So glad I got my long run done on Saturday that's for sure. I hit the gym a little after 9 am to get my weights done. I started with the elliptical to warm up while reading the May issue of Oxygen magazine. I almost stopped at one page, but am glad I turned the page. The next article was all about biceps. And that's what I was working. I saw a new exercise I really wanted to try - the drag curl. So I scratched hammer curls from my workout and added in the drag curl. After my workout, I got cleaned up and headed to Whole Foods. I didn't have a ton of stuff on my list, but just a few things I can't get at Kroger. Plus, I wanted to get out of the house. We ended up having a late lunch with friends at our fave hangout - Dugan's. We had wanted to eat on the patio, but it was just way too windy to do that. But, it was still nice hanging out with friends, relaxing, enjoying the sunny afternoon. Today I decided I wanted (needed) to get outside and enjoy the beautiful weather rather than be inside the gym. So, I headed to the river trails after work for my run. I prefer getting my runs in earlier if possible, but this really gave me something to look forward to today actually. A nice change of pace. It was about 67 degrees and pretty windy, but all sunshine. On my out half of the run, the wind was apparently at my back. Let's just say I had some pretty good time splits until I turned around. At first the wind felt good, helped cool me down. But then it just felt brutal. I was very glad to be running a flat route. Despite the wind, it was a really good run. 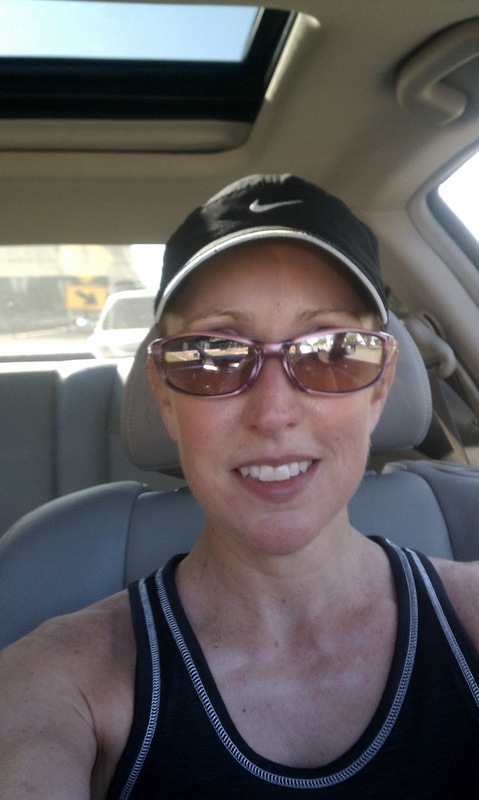 I got in 5.5 miles total and soaked up some sunshine and joy along the way. Last night I had made dinner for tonight - had a spaghetti squash that had to be cooked. But when Jason got home, he changed plans on me. I was stretching and rolling out when he walked in the door. He asked what was for dinner and I reminded him of what I had already made.